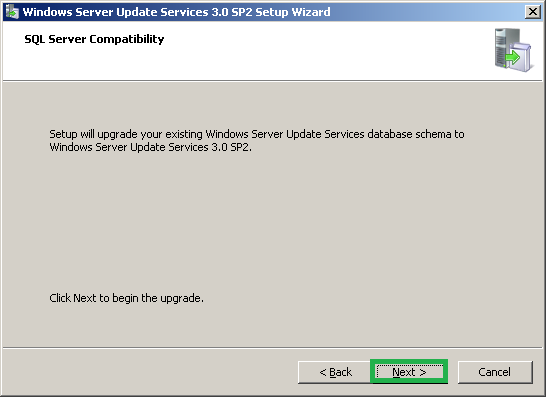 Check the WSUS version from add or remove program and make sure that it is WSUS 3.0 SP1. 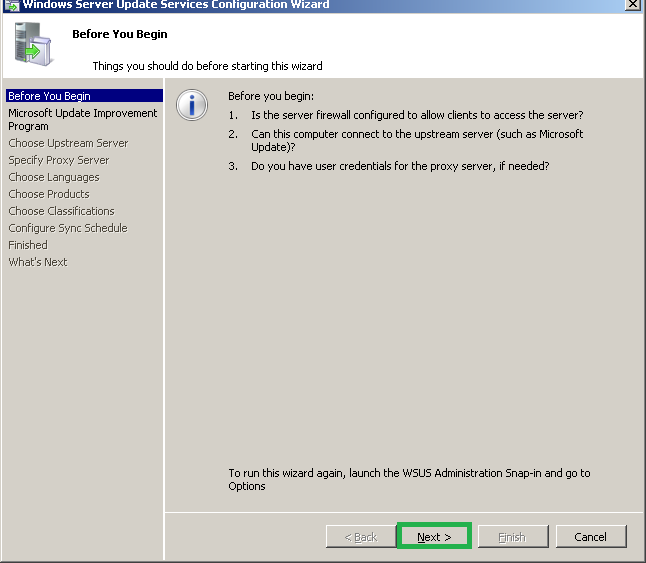 Select WSUS and if you click on more information you will have the below window. 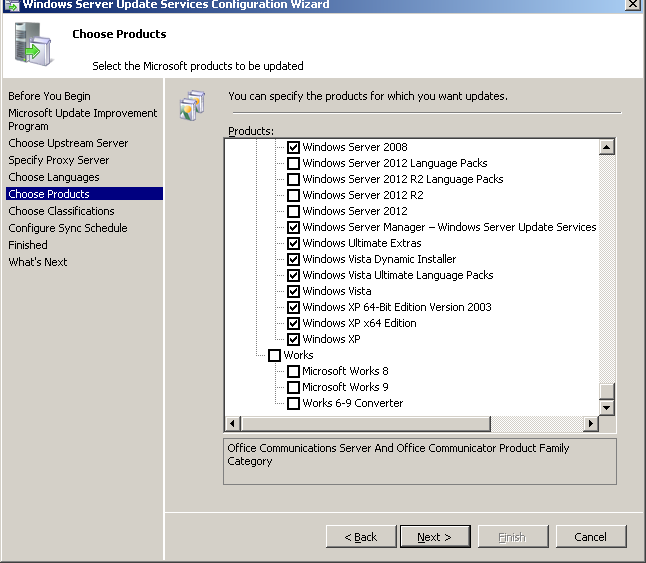 If you have WSUS server SP1 installed the service pack will be already available in your network. 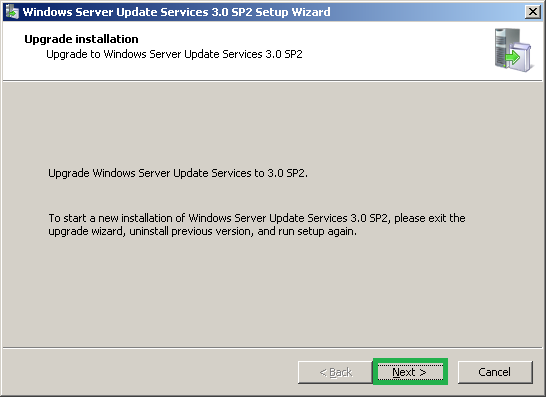 Open WSUS console and expand 'Server name'->Updates->select 'service packs'-> here you will be able to see the service pack for WSUS as 'Windows server update service 3.0 SP2(KB972455)'. Note: You will be able to see the tab 'service packs' only if you have selected the same in 'products and classifications'. 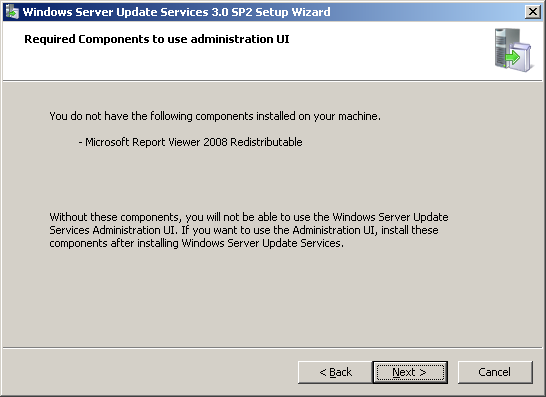 If the above conditions are true and you are able to locate the WSUS 3.0 SP2(KB972455), right click on it and 'Approve' it. 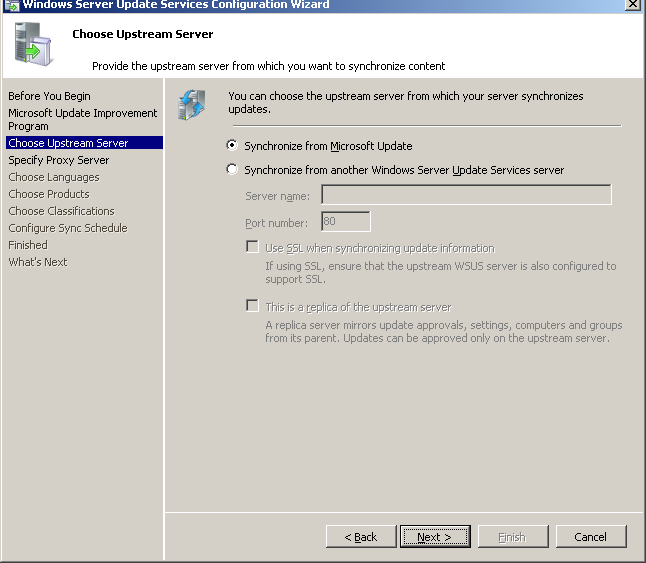 In order to reach the update to your WSUS server, manually run the windows update on WSUS server. 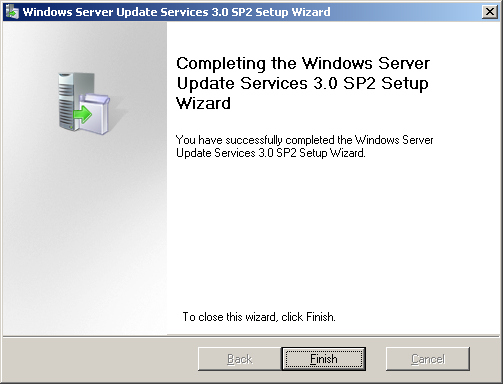 Since we have approved the update for installation when you manually run windows update it will show the WSUS 3.0 SP2 as an update to install select only this and click install updates. 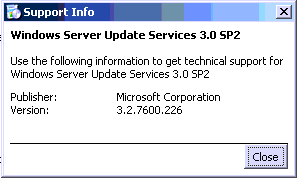 Download the windows server update service 3.0 SP2 from MS download center. 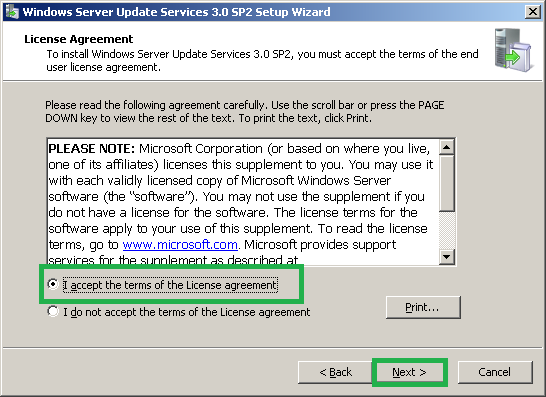 Accept the 'license agreement' and click 'Next'. 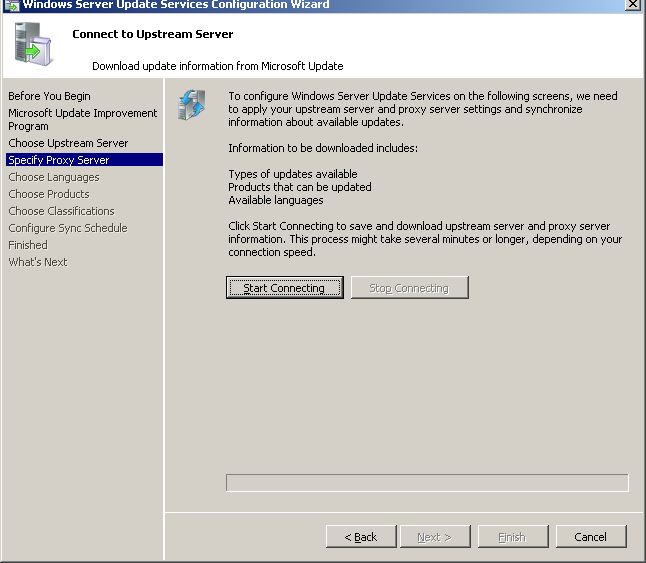 Now it will connect to your WSUS server which is installed for WSUS. 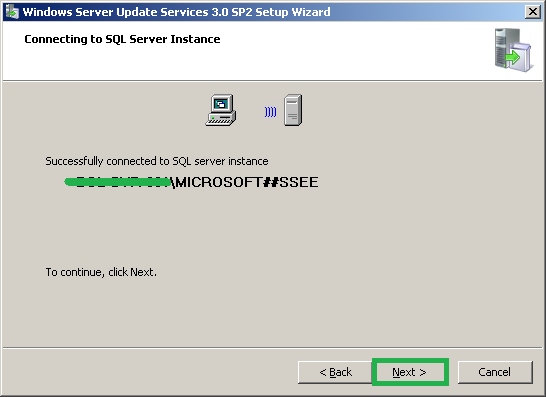 It can be either MS internal database or SQL server. Once it is successfully connected it will fetch all the relevant data for upgrade. 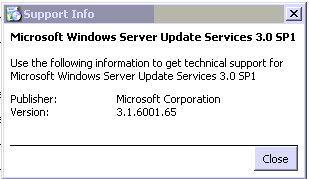 Click 'Next' once it is successfully connected. 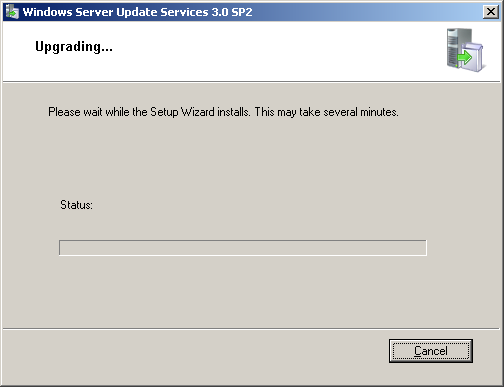 In order to start upgrade click 'Next' and wait for this process to complete. Once it is completed successfully click 'Finish'. 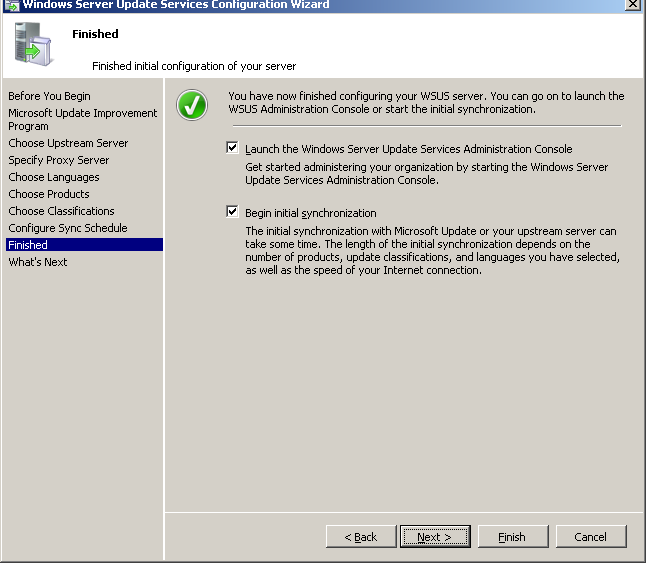 Now it will automatically open a window to configure WSUS. 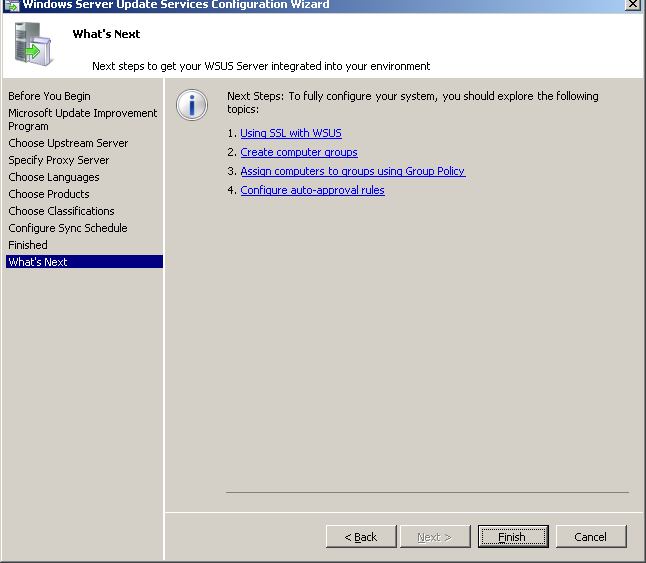 Click 'Next' to start configuration(You can complete the below operations later as well). 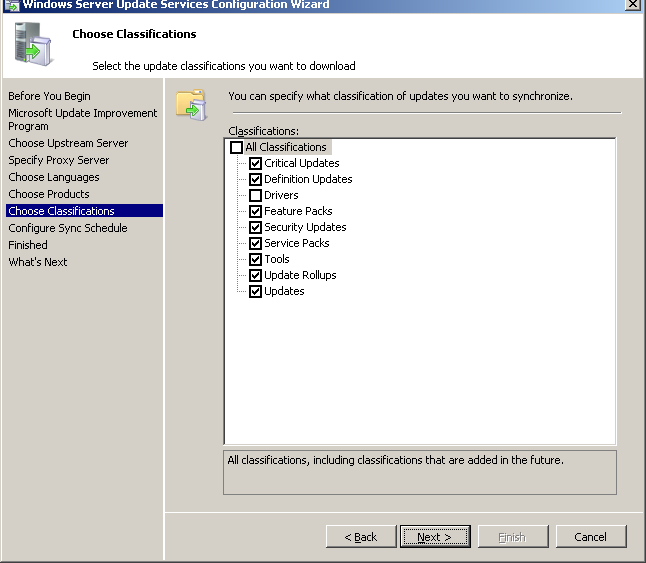 The below settings will be automatically detected from your previous version of WSUS but still you can redefine these settings. 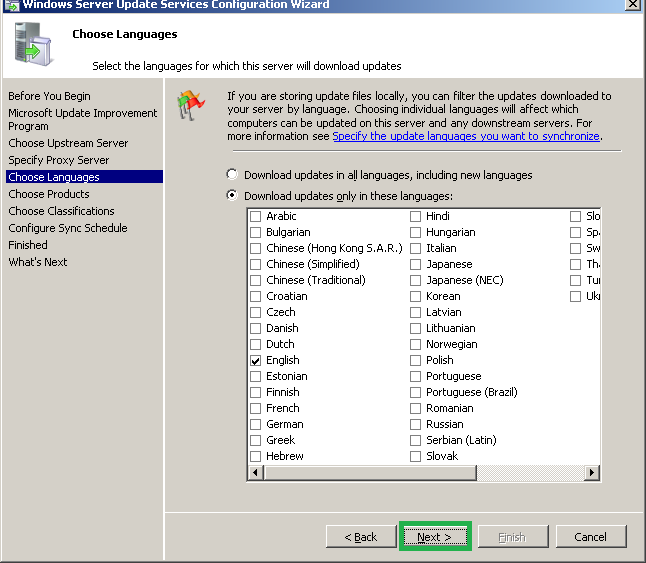 Specify the languages that you want to download the updates. I would recommend you to select the least number of languages since it will increase the disk space utilization. Click 'Next'(When you specify more than one language the updates will be downloaded in all those languages and will lead to use more disk space). 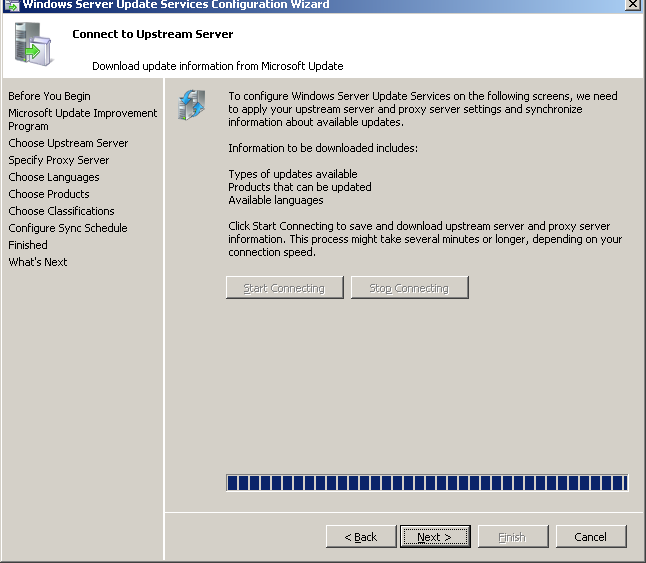 Now you need to specify the updates that are required in your network. 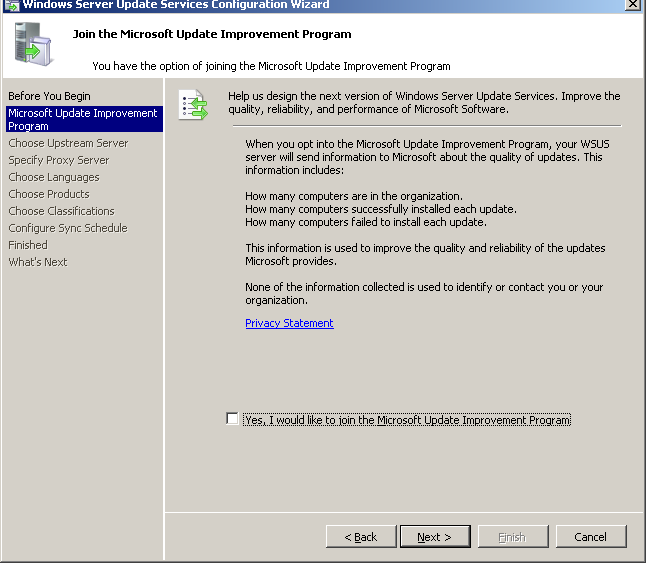 Verify each MS products that you are using and put a tick mark on the updates that are required, Click 'Next'. 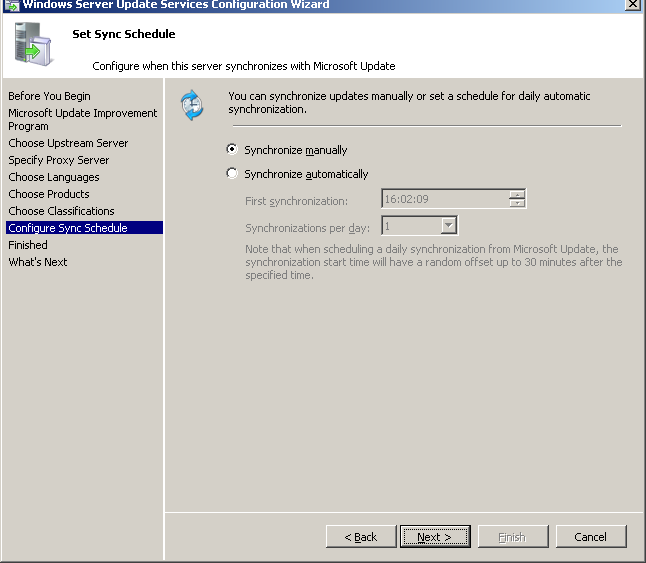 Specify the synchronization details either it can be manual or automatic as per your needs. 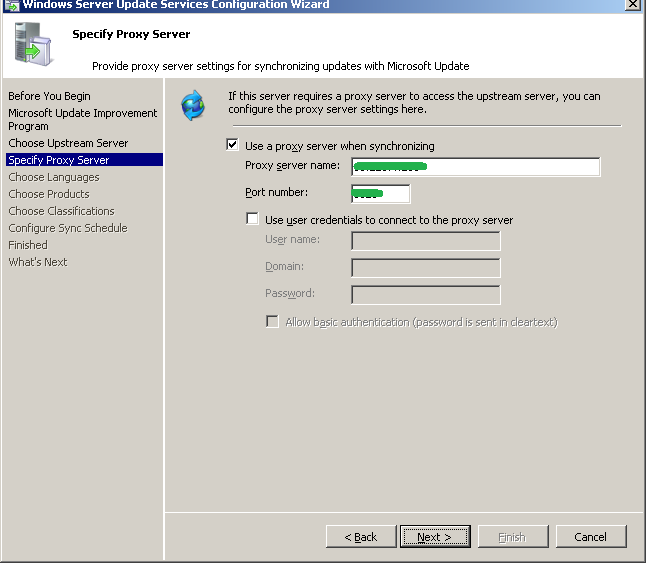 Now you can verify the WSUS server version from Add or remove program.